There are thousands of different spiders but only a few in the US, such as the Brown Recluse Spider, Hobo Spider, Yellow Sac Spiders, and the Black Widow, that are important to humans because of their potentially hazardous bite. Although all spiders have some toxins in their venom only a few are toxic enough to cause potential problems. 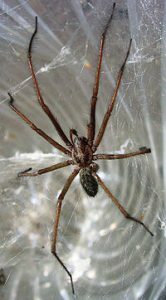 There is a myth that there are brown recluse spiders in the North West, however there have not been any positively identified. Spiders are active all year but most notably from spring to autumn while other insects are active. Need a pest control expert?